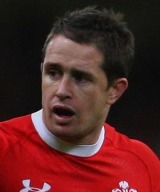 Shane Williams' size (he is only 5ft 7in tall) may have caused some to doubt him in his early days, but he silenced critics with his performances and went on to become one of the best wingers in world rugby and one of Wales' all-time greats. Renowned for his pace, side-step and runs, by the time he bowed out of international rugby with 87 caps to his name (plus four Test appearances for the British & Irish Lions) he had a raft of records to his name including being the record try scorer for Wales and the third most prolific scorer in the history of the game. Although he made his debut in 2000 his early years were blighted by injury and an indifference to his talents from the Wales coaching set-up. A series of hamstring injuries ruled him out of the Wales squad between 2001 and 2003, a time during which he has since admitted he considered quitting rugby altogether. He returned in time for the 2003 World Cup and by the 2004 Six Nations was able to hold down a regular place. He was a key part of the 2005 Wales Grand Slam, scoring the decisive try against England, and that earned him a place on the 2005 Lions tour although he only played one Test. After disappointing campaigns for Wales in both the 2006 and 2007 Six Nations, he was selected for the 2007 World Cup where he scored six tries during the tournament, including a stunning solo effort against Fiji. His career high came in 2008 when he was named the IRB International Player of the Year. His tries against Ireland and France secure Wales a second Grand Slam in four years and he was voted player of the tournament. On Wales' summer tour to South Africa in 2008, he scored in both Tests. He was selected for the 2009 Lions tour of South Africa, and despite struggling to find form he was selected for the second and third Tests, scoring two tries in the latter to help the Lions to a consolation victory. After suffering a serious injury in March 2011, Williams returned in time for the World Cup, which he had said would be his finale, and grabbed three tries as Wales finished fourth. He made his final Test appearance against Australia in December 2011, capping an outstanding international career with a try in the last act of the game. He retired from all rugby at the end of the 2011-12 season to take up a backroom role with the Ospreys but was later tempted out of retirement to finish his career in Japan.